The first version FPGABee delivered a mostly working clone of a ROM based Microbee - similar to the PC85B model. Although the original intention was to take it further, I decided to back track and take a different approach with version 2 so some of this information is now obsolete (most notably the console mode and PCU). 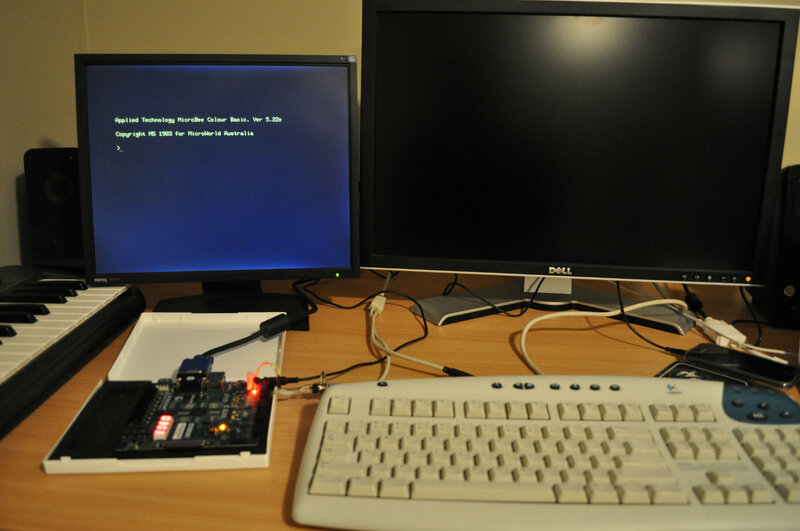 Getting started with FPGAs and VHDL and just enough ciruitry to boot a Z80 processor and display a blinking LED! Implementing a VGA video controller and mapping to memory layout matching that of a Microbee. The 6545 is the heart of the Microbee's video controller. This article looks at how it's implemented in FPGABee, including cursor logic. Covers connecting to a PS-2 Keyboard and mapping received key events to Microbee key-switches and then making them visible to the Z-80 through the CRTC. Debugging PCG graphics issues and getting a game I wrote in the 80's working on FPGABee! Connecting a speaker to the FPGA and getting Microbee sounds out of it. Implementing a virtual cassette interface and the Peripheral Control Unit as a user-interface to control it.